Going N. on I-25 take exit #271 - Mountain Vista Drive Exit. This is the exit at the Anheiser Busch Plant. Take exit #271 and continue north on the frontage road for 4 miles, until you get to East County Rd. 58. Turn east on East County Rd. 58 and go 1 ¼ miles. We are located on the south side of East County Rd. 58. Our address is 5429 East County Rd. 58, Ft. Collins, CO. 80524. All of our fences are white and our buildings are blue and white. Our facility is very visible from the road. There is lighted signage at the driveway entrance to our facility that reads, "Stonestreet Stables". 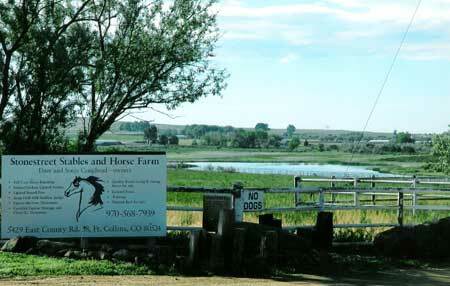 We are located 15 minutes from "Old Town" Ft. Collins, and the main Colorado State University (C.S.U.) campus.